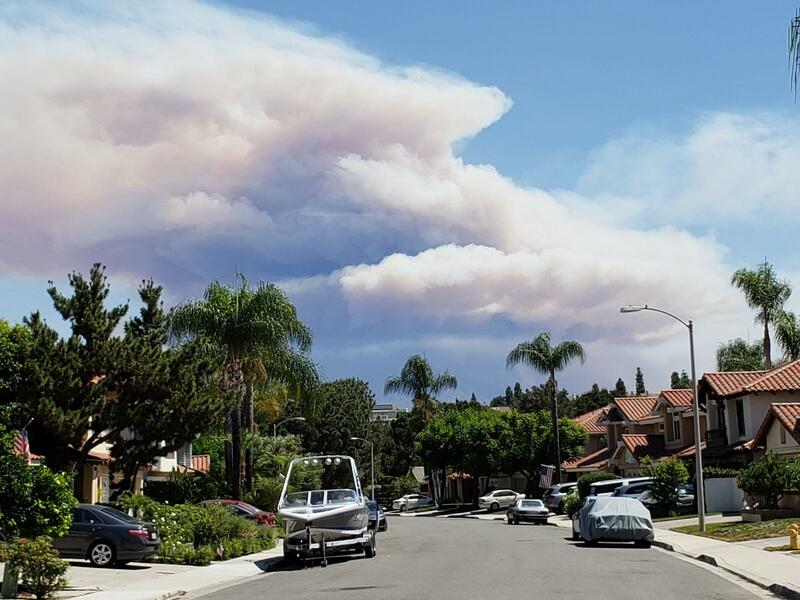 Plumes of smoke from the Holy Jim fire seen from Mission Viejo, California this afternoon. Holy Jim is 17 miles east of Mission Viejo, a community between San Diego and Los Angeles. As of this morning, the Ranch Fire has burned 251,166 acres and is 46% contained. The River Fire has consumed 48,920 acres and is 81% contained. Both are Mendocino Complex fires. The Carr Fire has scorched 173,522 acres and is 47% contained. Firefighters from Galveston, Texas and other states are there or traveling to control and put out the California fires. This entry was posted in Asian Community Alert, Asian Community Houston, National News and tagged California Wild Fires, Holy Jim Fire. Bookmark the permalink.